We pride ourselves on friendly, relaxed chiropractic care. 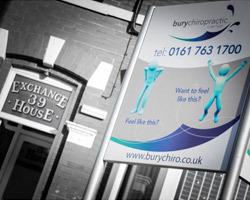 We want you to feel comfortable and reassured when you come into our practice. If you choose, we will proceed with your first Chiropractic experience. If at any time we feel that Chiropractic care may not be for you, we’ll refer you to someone who can help you. During regular visits you should be in and out of the practice within 10 to 15 minutes.